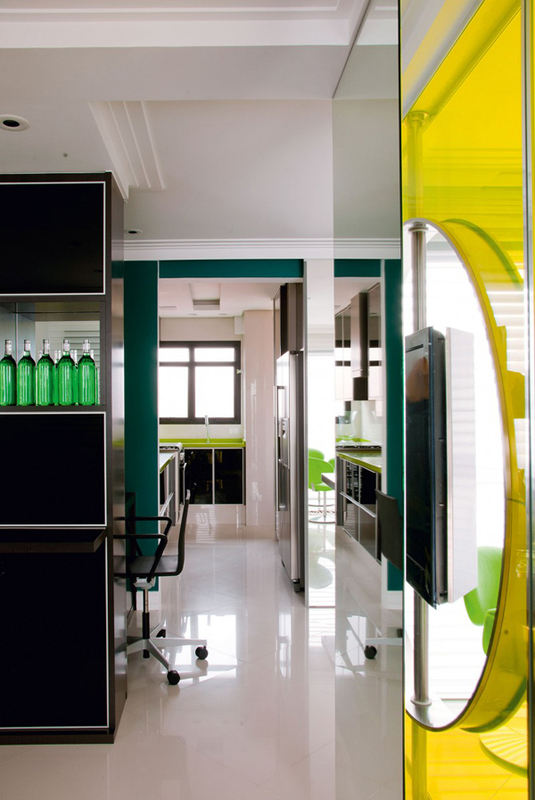 This amazing apartment in Brazil was designed by Brunete Fraccaroli. Though not very spacious the apartment includes all the necessary areas including a home office nook. 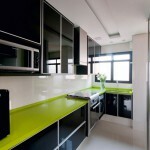 The modern style and the unusual bright color scheme make for a really interesting look. 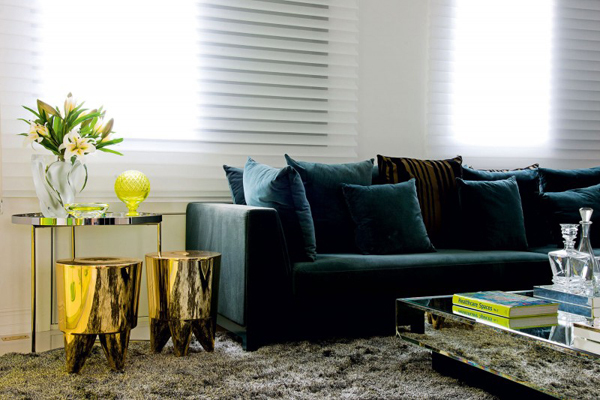 Mixing neon yellow and lime green with dark teal and gold metallics Fraccaroli created a very special color scheme. Painted white the apartment features some neutral elements like a black glossy storage and a grey carpet along with brighter elements like a dark teal sofa or a teal wall. While the brighter accents definitely stand out against the neutral background there are even brighter accents that contrast and match with the bright elements. 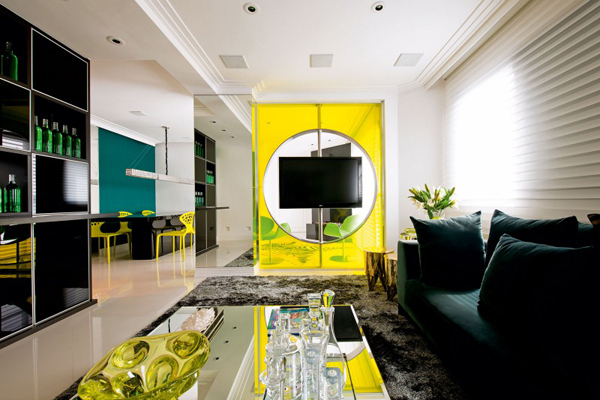 There is a neon yellow transparent wall that divides the family room from a sitting room with a fireplace and there are matching yellow chairs set afainst the black glossy table. This makes for a rather vivid combination but to enhance the effect the designer also plays with textures adding mirror tables and metallic side tables to the picture. The interior is also beautifully decorated. 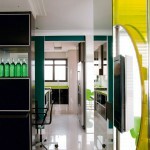 The black storage is filled with bright green bottles and greatly contrasts with the yellow dividing wall with a built-in TV. The chairs of statement designs are used in the dining and the sitting rooms. 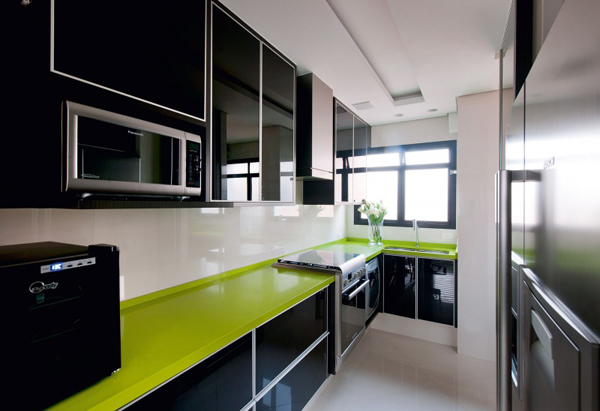 The monochrome kitchen is jazzed up with a lime green countertop. All of this might be just a bit too exuberant but together it looks quite well. The use of space is also practical. There is an office nook in the side of a black glossy storage wall. 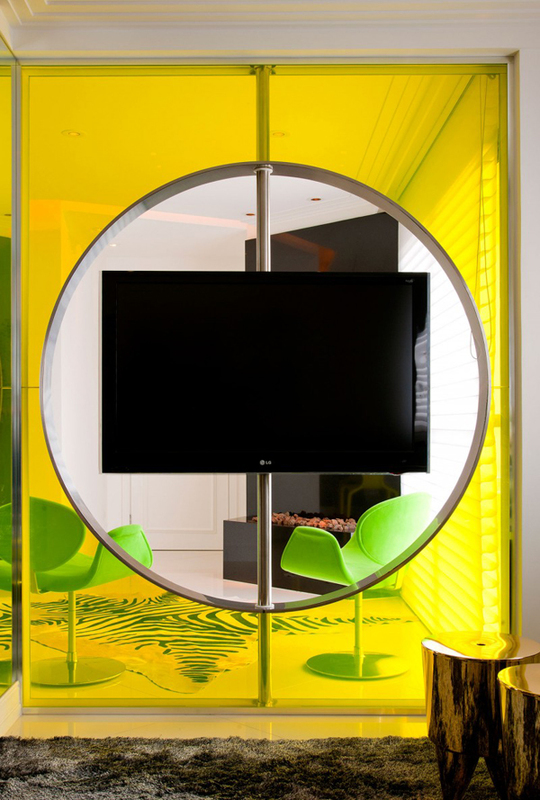 The space in the living room is visually enhanced with a mirrored column that makes the apartment look bigger from both living and sitting rooms.